Feb 11, 2017: Oculus: PLEASE sell us an extended cable!! 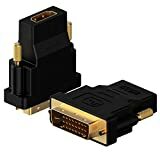 Jan 02, 2018: PS4 not connecting to my monitor through DVI-D to HDMI converter, any ideas why? Sep 14, 2018: Trying to connect fire stick to PC monitor, shows amazon logo and then black screen.